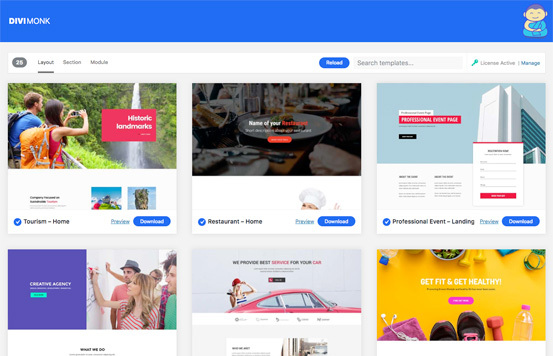 BUILD BEAUTIFUL DIVI WEBSITES FASTER THAN EVER. Divi Monk’s cloud-based Template Library gives you access to hundreds of reusable designs. This will save you time and efforts, speeding your development process. Get access to a huge template library and instantly install the designs you need. You can change the branding easily for Divi Monk and name it to yourself. Hand crafted by experienced designers so that you can use them right away. Reusable sections and page templates will save you a lot of time. Good design with balanced call to actions help you generate more leads. Completely mobile responsive templates. Looks good on all devices. We keep adding new templates regularly to match the latest design trends. Build your own WordPress Multi-site network or a website builder platform. We take pride in building great products and providing amazing support. A huge library full of handcrafted blocks and pages for Divi Theme & Builder. Divi Monk offers white label branding so that you can change the plugin name, developer name and other details to provide a seamless experience to your clients. Browse the templates from your WordPress admin, install and use the ones you like. 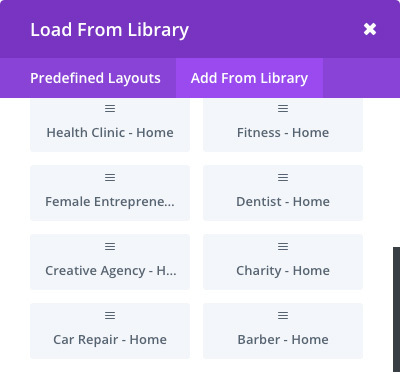 Get access to all the installed templates in Divi Library and load them as you build a page. 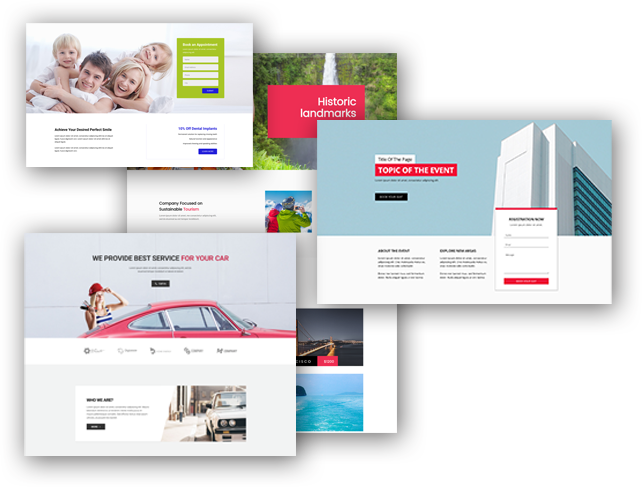 START BUILDING BEAUTIFUL DIVI WEBSITES. Got questions? Check this section and see if you have found the answers. What is Divi Monk Templates? Divi Monk Templates is a cloud-based Template Library for Divi Theme and Divi Builder. How Divi Monk Templates Work? You will need to install Divi Monk Templates plugin and activate your license. After that you can browse all the available templates from WP admin and install the ones you like. Can I save my Templates to Divi Monk? How will Divi Monk help Me? Divi Monk Templates is a huge time saver it gives you access to professionally designed page templates, modules, and sections. Drag and Drop to build your new website. Can I re-use the images? We use free images from sources like Unsplash and Pixabay which can be reused. Some stock images are watermarked and will not be suitable for re-use. Will You add more Templates? Yes, we will keep adding new layouts, sections and module templates to the Divi Monk Library. Do you add any credits to your site in Templates? No. We do not add any credits/comments/links in the templates or the template source code. Can I use Templates for Client Sites? Yes, you can. You are free to use this for all personal and client sites. Can I use it on unlimited sites? Yes, you can use it on unlimited personal and client sites. Can I White Label it? Yes, this feature is avialble in Lifetime package. You can use change the plugin name, developer name, website, branding colors and even hide it from the plugins list. Check this video for more. Not at all. Divi Monk Templates is light-weight and doesn't add any code bloat to your site. Do I get a Renewal Discount?? Yes, you will get 30% renewal discount. But, you must renew your license before it expires. Will I get access to new Templates? Yes, you will be able to access all the new and existing templates during your subscription period. Can I delete the plugin after using the Template(s)? Yes, you can. Deleting the plugin won't break anything on your site. The layout gets imported on your site and stays as it is. STILL WAITING TO GET STARTED? Divi Monk gives you access to a wide range of professionally designed templates.